A pair of leather shoes on a bus stop bench, a torn football by a bin, a wooden tennis racquet propped against the wall. Jack's matter-of-fact images evoke the journeys objects take towards obsolescence, suggesting an easy-come, easy-go attitude to mass-produced goods. And yet a melancholy hangs over these discarded bits of lives, evocative of human loss and of how the shedding of things leaves us strangely diminished. Once they are broken, we can no longer take them for granted; they disturb and unsettle us. Jack not only photographs discarded and lost objects, she brings them back from the brink. The leather shoes have been repaired, polished and embossed with golden words. The football re-stitched and inflated. 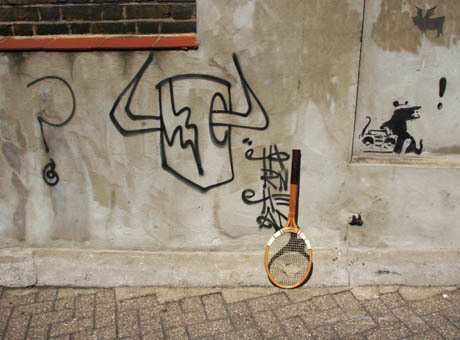 The racquet has been made fit for a new purpose, migrating from the street to the gallery.